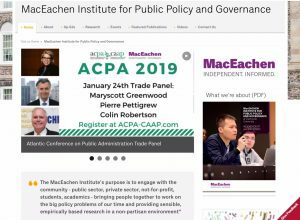 The MacEachen Institute for Public Policy’s 2019 event schedule promises dynamic discussions. CEGE Connection reached out to Warren McDougald, Communications Officer and member of the dedicated team at the MacEachen Institute, for a virtual interview. 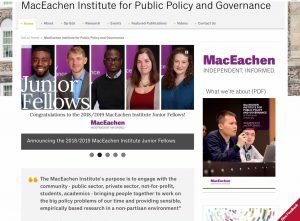 The MacEachen Institute had a stellar 2018 line-up of events, with more coming in 2019 that will encourage active involvement. January 31, 2019 the MacEachen Institute will host a grad student round table on “The Canadian Climate Policy and the Turnover problem.” Award winning historian, Dr. Jerry Bannister will moderate the event, which will offer the opportunity for a cross-disciplinary platform for ‘graduate climate researchers’ to collaborate, pool ideas and resources, and engage with knotty climate change issues. This grad student round table builds on the MacEachen Institute for Public Policy’s October panel discussion, Science and Policy: Should Scientific Information Have Pre-eminence in Public Decision-making? When politicians debate big issues like reducing greenhouse gas emissions, protecting marine environments, or granting permits for clearcutting, should scientific evidence always take priority in the decision-making? Not always, according to speakers at October panel discussion. Former MP Megan Leslie joined a panel alongside UK journalist Daniel Cressey, St. FX professor Richard Isnor, and Dalhousie Professor Jeffery Hutchings, at the MacEachen Institute for a discussion about the importance of scientific evidence for government policy. The talk was a part of the MacEachen Institute’s Policy Matters speaker series, a weekly fall series that is open to the public and aims to encourage public engagement with local, national and international policy issues. The central question up for discussion at this talk was “if evidence supports development of a policy, shouldn’t the evidence be given priority in policy decisions?” In practice, however, the model faces many challenges. Even though governments broadly state that their decisions will be based on research evidence, researchers frequently wonder why evidence seems to be ignored. Evidence to resolve serious environmental and societal problems is available, but solutions seem to be elusive. Leslie’s opinion was at odds with some of the scientists in the room, who spoke about the need to use academic research as a basis for finding solutions to policy problems. UK science journalist Daniel Cressey emphasized the demand for “evidence-based policy” in government but acknowledged that it’s difficult to present complex academic findings to politicians. “Academic evidence is not cutting through to parliamentary decision-making and that’s because it arrives late, if it arrives at all, it comes laden with technical jargon, and it’s massively long,” says Daniel Cressey, Deputy Editor of Research Fortnight, London. 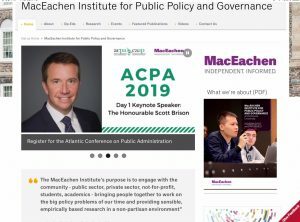 If you’re interested in learning more about whether scientific evidence should have pre-eminence in public decision making, a video of the full talk is on the MacEachen Institute’s website and their YouTube Channel.